How was the supposed common ancestor of Chimpanzee and man look like? Was he in shape betwen man and ape? Was he more like humans than chimps to us now? Then how did he degenerate to be a Chimp? Chimps did not degenerate to be a chimp. Their ancestors took a different evolutionary path, where strength was more important than intelligence. There were numerous species leading to modern humans after the split between the branch that led to chimps and the branch that led to humans. Those that are closest to human form would be all of the "Homo..." species you've probably heard of. (E.g. Homo habilis, Homo erectus, and a dozen others you've probably never heard of.) To see what they probably looked like, as best as we can tell from fossils, just do a search on any of the various homo... species. Also, nothing "degenerated" into modern chimps. Modern chimps are just as highly evolved as modern humans. They simply followed a different path. To see the branches of species between early primates and modern humans, you can look here. If you scroll down about halfway, you will see a blue-shaded area with a nice tree diagram and about in the middle of the tree you will see the split between the path that led to humans and the path that led to chimps. Beware, however, that this diagram can be deceptive. It looks as if the chimp branch comes to an end a long time ago, but actually that branch does not end; it is just as long as the branch leading to humans. As I said earlier, chimps and humans are both just as highly evolved. For simplicity, the diagram simply doesn't bother to show the full lengths of all possible branches. Last edited by Gaylenwoof; 02-09-2013 at 03:38 PM.. There is no reason to think that Man or Chimps resembled their present form at the time they diverged. The could have a common ancestor quite different from what Man and Chimp separately evolved into. The history of the world in 2 hours when into this topic and was very good. I would guess the common ancestors were more like modern day non-human primates than than humans for the simple reason that modern man has evolved more because of his own actions while non-human primates have evolved mainly by the gradual changes in nature. I believe that many paleo-anthropologists side with that Pierolapithecus 13 MYA was the closest primate to the Last Common Ancestor of all humans and hominoidea (apes). 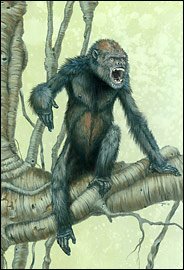 It definately was aboreal (lived in trees) unlike the Australopithecines (first apes to walk upright) some 8 to 9 million years later. Within a million years it had evolved into Dryopithecus 12 - 9 MYA. Artist rendering of Pierolapithecus in accordance of it's fossil findings. It might help to consider the larger basic picture of the emergence of life on the planet and how things have branched off over time. There are of course there are still plenty of specific details missing, but the basic picture has developed giving us a better idea about evolution and how humans fit into that picture. I think it's worth taking into account that it's not likely we'll ever be able to point to a particular fossil and say, here's where humans began, although new discoveries are made helping clarify the picture a little better. Changes over millions and billions of years have been very slow and gradual, with tiny changes here and there. I think it's more reasonable to say that apes, chimps, humans, etc., are primates, which in turn stems from earlier forms of mammals. Here's a short video series (about 17 minutes total) that gives an interesting view about it. OP, please remember this is the Science forum, not Religion.